The Manchester Walking Football October 2017 session saw fourteen teams in three divisions playing on one of our normal Manchester glorious sunshine days. A total of twenty six matches were played with thirty two goals scored, eleven in Division 1, fifteen in Division 2 and six in Division 3. The highest score on the day was a 3-1 victory for Roach Dynamos against the depleted Maccabi Old Codgers in Division 2. In Division 1, Rochdale AFC Strollers maintained their six point lead, with the Spring champions, Vintage Celtic moving into second place, two points ahead of Chadderton FC WF. Both the Rochdale side and Celtic grabbed eight points in this Manchester Walking Football October 2017 session, Chadderton gaining five points, Nash Amblers two points and Rochdale Striders also with two points. It’s differing outlooks for the two Rochdale sides, with the championship only the Strollers to lose and the Striders looking likely for relegation without a single goal to their name in eight matches. Although my own side, Vintage Celtic have gone twenty three games without defeat, conceding only one goal, that an own goal as well, they haven’t the fire power of the Strollers team and are four goals inferior to them in the goal difference stakes. Division 2 is looking tight with both the Fylde coast teams, AFC Blackpool Senior Seasiders and Fleetwood Town Flyers contesting the top two spots. Blackpool are three points ahead on seventeen points, even though being beaten 1-0 on Friday by the Flyers, who are on fourteen points. Bolton Wanderers A are not far behind on eleven points, with new boys Roach Dynamos on eight points and Maccabi Old Codgers looking likely to be relegated on two points. Nothing much separates the top three in Division 3, with Wakefield Wanderers on ten points, just one ahead of new boys Bury Relics on nine points and Nash Bees on eight points. Bolton Wanderers B prop up the table on four points. Blackpool player Wai Hon Tsang scored six goals in this Manchester Walking Football October 2017 session and leads the Golden Boot award, with Roach Dynamos, Mick Tarpey on four goals and five other players on three goals. There are some really good goalkeepers in this league and after two sessions only two of them have kept clean sheets. Pete Smith of Fleetwood Town Flyers and my own keeper, the Spring season Golden Gloves winner, Mike Kieran of Vintage Celtic are both looking good for the award. Not far behind are Steve Hyde of Blackpool, Ron Blakely of Rochdale Strollers and Mick Wilde of Wakefield Wanderers, all having only conceded one goal. It’s still all to play for in both the Golden Boot and Golden Gloves award in December, whoever wins them will fully deserve the awards as this league has some excellent teams and players. Once again thanks to all our excellent referees, without who this league wouldn’t prosper. Also to Barry Woodburn for his usual efficient registration duties and of course Paul Gardner who manages the venue and match day tasks. 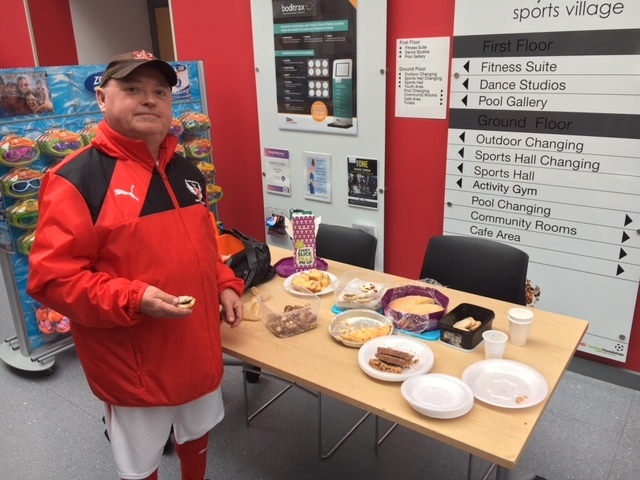 A special mention to Peter Thomas of Fleetwood Town Flyers, who normally brings cakes for the after match brew. Peter was collecting for the McMillan Nurses, a great cause, who anybody touched by cancer will testify to. Despite some teams leaving early before the refreshments were available Peter managed to collect a grand total of £135.92 from the teams that were still there. Well done Peter, a great effort on your behalf. Another cracking days football with really helpful and practical organisers and officials. Always made welcome and League is well run and refereed. Thanks from all the lads at Wakefield. Efforts of all at Heywood are much appreciated. Another brilliant morning over in Rochdale. Excellent competitive football in a fair and reasonably relaxed atmosphere. Great organisation as always and well done to “Pork Pie Pete” from Fleetwood. Magnificent gesture. Perhaps we could donate to this each month in future as well.